On the beach in front of my mother-in-law’s house in Rincon, Puerto Rico, are three almond trees. 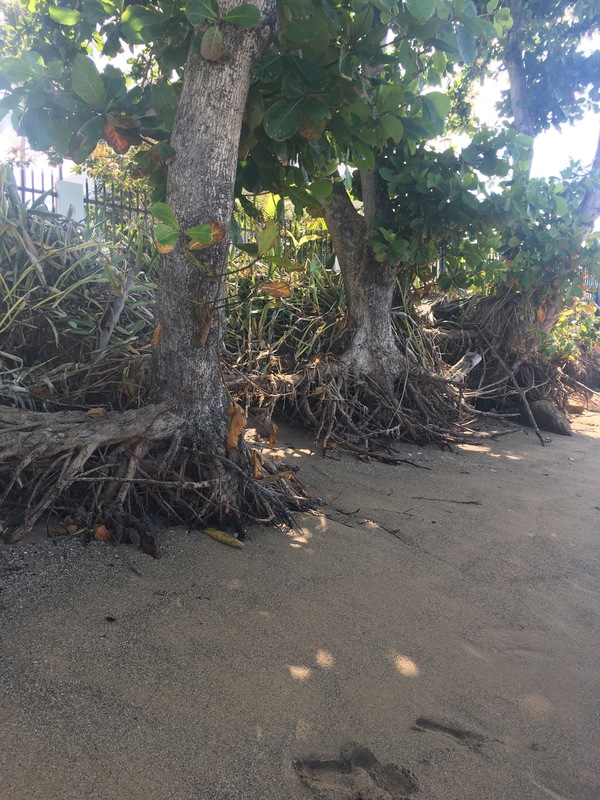 When we arrived to visit in February, months after Hurricane Maria had devastated the island, the trees, which were badly hit during the storm, seemed to still be in a defensive crouch. Their limbs looked contorted, but everywhere, seemingly on every branch, were leaves. Looking at the trees one had the distinct impression one was looking at what the world will be like in warmer places if we continue to fail to address global warming. The trees will morph into dragons. The island’s beaches are as beautiful as ever. But they appear to have been rearranged. Huge felled trees had been tossed like sticks and buried in sand: other trees had had their tops ripped off. The currents had moved the sand so that it was still smooth and beautiful, but eerily unfamiliar: higher in some places and lower in others, like a captured wave. There was similar resilience in the voices of many people we talked to, but as in Leticia’s case, there was also palpable PTSD. A surfing teacher, Issa, seemed still exhausted by life in the storm’s immediate aftermath. He and his wife had gotten up at 5 or 6 each day in order to wait in line to get gas, do what they had to do during the day and return in time to visit his parents and make sure they were safe, before getting home by curfew. Another surfing teacher, Justin, described in detail what it was like to cook lizard. He and his family had lived on canned food and made phone calls using a repurposed car battery. There was a feeling of nostalgia for the sense of community following the storm, familiar to New Yorkers who were in the city after 9/11; but there was none of the accompanying sense that anything significant was being done about the disaster. Or that there was any reason to believe the island would be any better prepared if it happened again. After the storm, Leticia had a solar panel put on her roof which she says takes care of some of her electrical needs. She showed us the nest of nobs and dials newly established in her downstairs apartment. She told us that after the storm, many people were unable to use their solar panels because they had blown off and there was no one available with the expertise to put them back on. During our visit, her friend Nestor, a professor who promotes Puerto Rican artists, came by. He plans to create a poster with a grasshopper on it — esperanza, the Spanish word for hope is also the Puerto Rican word for grasshopper. But neither he nor Leticia were sure there was much cause for hope given the lack of support from the federal government. My wife’s cousin, Yamil, a doctor, and his wife, Maria, a school librarian, have chosen to remain on the island with their two children. His mother and father and sister left a few years ago, like many people from the island, for Orlando, Florida. His brother is an anesthesiologist and lives with his wife in Arizona. Besides being a doctor, Yamil has become something of an amateur weatherman. 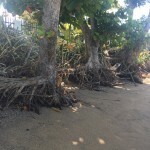 During two trips to Rincon, the first in February, the second in March, our experience of the island’s recovery was definitely mixed. On the drive into Rincon from the airport in Aguadilla, power lines along the highway appeared to have been jerry-rigged, doubled up in some places, as if someone had patched together a solution and gone home. On the side of the road from town to our house, what looked like a transformer appeared to have fallen to the ground and been left there wrapped in a snarl of wire. Further along wires hung down by the side of the road, as if they’d been cut. We experienced our first of three blackouts during a visit to a wonderful new restaurant called Mangia Mi, just off the main square of Rincon. Mangia Mi was started by a couple from the mainland who told us they made it a priority to employ local people who they then train: they say all of the local young people currently working in the kitchen were hired as high school seniors and have worked their way up from dishwashers to being able to run the kitchen when the chef is away. Both owners were on hand: one was the chef while the other handled host duties. One of the owner’s mothers was visiting and had taken on the role of pastry chef. She had just begun whipping up the frosting for what would turn out to be an incredibly delicious cake when the power went out. Emergency lights came on and the staff calmly began explaining that they wouldn’t be able to take credit cards. Five minutes or so later the power came on again and the mixer went back on too covering the Mom’s apron in frosting. Outside Shipwreck, another local restaurant, a man stood chatting with a couple in a pickup truck. Their theory was that there had been a fire in a substation. “They’ll fix it pretty quick,” one of the men said. I went home reassured and the power came back on not long after I got there. The third blackout was happily only a few minutes long. In such a beautiful place, and with people who seem so reassuring, it is easy to see this as recovery. But it’s not. People are learning to live with a situation that is unacceptable and untenable. And beneath the resiliency is a sense that there is nothing anyone can do. Under a more enlightened federal administration, Puerto Rico would seem to be the perfect test case for how to respond to global warming. The government could create an electrical Marshall plan, modernizing the grid instead of just rebuilding it and providing solar panels. It could help with reforestation — reportedly one of the best ways to protect an area during a hurricane. Instead, the newly appointed education secretary, mimicking her federal counterpart, is pushing charter schools. Here is a place with a wealth of teachers leaving for the mainland along with so many other Puerto Ricans. Attempting to dismantle the system does not seem to be the answer. There is hope here, and resilience, but there is also fear. Hurricane season comes in August. “If another one comes, I don’t know what I’ll do,” said Yamil, possibly at the limit of his patience. And that is reason to worry.